A little taste of what we have to offer. We have abundant wildlife on our acreage including kangaroos, galahs and kookaburras - and 4 pet alpacas guests are welcome to feed and photograph. WINNER 2018 Luxury Motel & Restaurant of the Year - Australasia, awarded by International Luxury Travel Guide; Silver Medallist of the South Australian Tourism Awards 2016. The iconic Clare Valley Motel is located a few minutes from the centre of Clare in the heart of the Clare Valley. Situated on 16 acres, surrounded by trees and bird life, Clare Valley Motel, renowned for its friendly service, great restaurant and reasonably priced accommodation, offers 33 comfortable, well appointed rooms in a tranquil, relaxed setting, guest barbecue facilities, private walking trail and helipad. Relax with a cool beverage in the 'Armagh Bar' our Champagne, Cocktail and Wine Lounge. 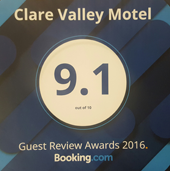 Clare Valley Motel has been a proud recipient of the Trip Advisor Excellence Award for the last 6 years. 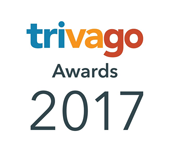 Click on the Trip Advisor Logo to view our guest comments. Clare Valley Motel is a quality assured tourism business.